Orlando, Fla. – The long anticipated Four Seasons Resort at Walt Disney World Resort is back on the table. After being shelved for more than three years, Four Seasons Hotels & Resorts officially announced this week the $360 million resort is finally coming to the Orlando market at a prime piece of property inside Walt Disney World. 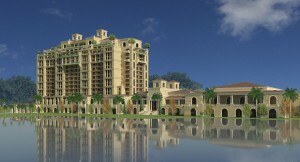 Four Seasons expects to open its second property in Florida by mid or late 2014. It will be the third Four Seasons Resort in Florida (Miami and Palm Beach are the other locations). Four Seasons had originally planned to build an Orlando-area resort at Celebration, the acclaimed mixed-use master-planned community created by Disney about five minutes from Walt Disney World, but Four Seasons never went through with that proposal. Four Seasons finally moved forward with its Orlando project after securing a partnership with New York-based real estate developer Silverstein Properties and New York-based private equity group Dune Real Estate Partners. Construction on the 440-room resort, which will be the largest Four Seasons resort in the world, is scheduled to begin in December. Toronto-based Four Seasons Hotels acquired the land from Disney in August 2008, and will retain a 30 percent ownership interest in the project in addition to operating the resort. The property, located in the northeast portion of Disney World, encompasses the highly acclaimed Tom Fazio-designed Osprey Ridge Golf Course. Four Seasons has been working closely with New York-based Silverstein Properties, one of the nation’s most respected real estate development, ownership and management organizations, since July 2009. Silverstein advanced the design and master plan for the new resort in consultation with Four Seasons, including acquiring necessary approvals, assembling and directing architectural and engineering teams, and negotiating the construction contract with Turner Construction. This effort enabled financing to be secured, according to Four Seasons. When completed, the Four Seasons Orlando development will feature 444 rooms and up to 40 Four Seasons Residence Club units and up to 90 Four Seasons Private Residences. Within the resort will be several dining venues including a rooftop restaurant with Magic Kingdom views; a 14,000 square foot spa with 18 treatment rooms; a fitness center; three pools and a lazy river; sports facilities including tennis courts, basketball court and climbing wall; two recreational centers for children, teens and families; and approximately 37,750 square feet of meeting and event space. As part of this new Florida golf resort evelopment Four Seasons plans to renovate the existing Osprey Ridge golf course, and will subsequently manage the course. Four Seasons Resort Orlando at Walt Disney World Resort is located within the newly launched Golden Oak residential community, an exclusive private gated community created and master-planned by Disney.